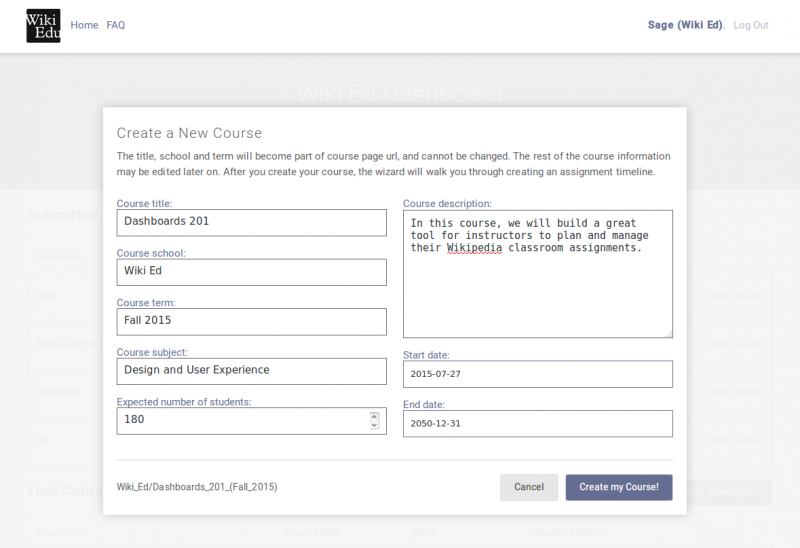 The new course creation interface in the Wiki Ed Dashboard. The newest version of the Wiki Ed Dashboard is up and running! Instructors can now go through the entire process of setting up a course, designing a Wikipedia assignment, and keeping up with students’ activity — all from dashboard.wikiedu.org. Until now, our systems for setting up and keeping track of Wikipedia classroom assignments have been a bit of a patchwork. For designing assignments, instructors in the Spring 2015 term used the Assignment Design Wizard, a standalone web app that walked instructors through the steps of customizing an assignment plan and then posted it to Wikipedia. Before that, a set of wiki templates would provide instructors with some basic syllabus boilerplate. For setting up the course, instructors have been using the EducationProgram extension on Wikipedia, which let student editors enroll in the course and list their assigned articles. Then the initial version of the Dashboard provided an overview of class’s contributions. The new dashboard.wikiedu.org brings all these features together. Instructors and students can log in using their Wikipedia accounts. The Dashboard automatically updates Wikipedia pages on their behalf to show their assignment timeline and to indicate who is working on what. The Dashboard fully handles the course setup and assignment design process, and gives an even better picture of what student editors are doing throughout the term. Last month, we piloted this new Dashboard to set up our Summer Seminar in Psychology, and now we’re opening it to all fall 2015 courses. The ongoing summer classes will be the last set to use the legacy course system. To get started with setting up your spring course, just go to dashboard.wikiedu.org, log in, and click “Create New Course”. We’ll continue refining the Dashboard and adding more features. If you find a bug, or if you have ideas for the Dashboard’s future, let me know: sage@wikiedu.org.